Heading into the meet-concluding 4x400-meter relay at the NJSIAA North Jersey, Section 1 Group 1 Championships on Friday night at the Bennett Center in Toms River, the girls title was up for grabs between four teams! In the four-way thriller, Kinnelon had 47 points, Mountain Lakes 46, Glen Rock 44, and Hasbrouck Heights had 41 when those squads lined up for the crucial baton battle that would determine the team champion. Hasbrouck Heights won the 4x400 in 4:21.54 to finish with 51 points and Mountain Lakes was third in 4:23.53 to also finish with 51 points. 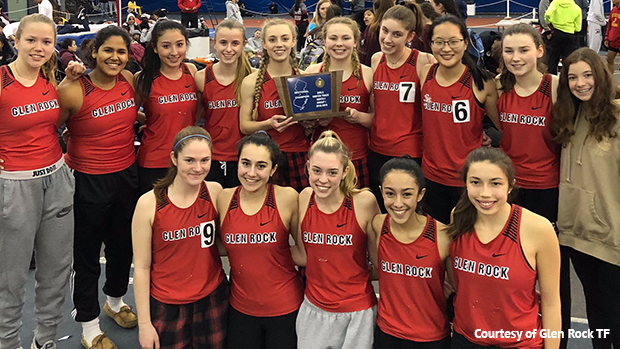 But Glen Rock slipped in between those two with a runner-up finish in 4:22.15 to capture the team title for the second straight year with 52 points. Kinnelon was fifth in the 4x400 and wound up fourth in the team standings with 49. The Glen Rock girls were led by Sara Hutchins, who wasfirst in the 55 dash in 7.47 and ran on the relay, Karina Roze (37-9 3/4) and Kaira Torres (29-4 1/2), who went 1-2 in the shot put, Bella Smith, who ran on relay and was third in the 800, Mary Andreou, fourth in the 1,600 and sixth in the 3,200, and Katie O'Connell, fourth in the high jump (4-8). Mountain Lakes received a sensational distance triple from freshman Grace Wills, who won the 800 (2:31.51), placed first in the 3,200 (11:57.42), and finished first in the 1,600 (5:24.12). In the boys competition, Mountain Lakes rolled to a 73-55 victory over Hasbrouck Heights. Defending champion Glen Rock was third with 56. The Mountain Lakes boys have now won three sectional titles (2014, '17, '19). On the boys side, Justin Moran and Jared Cooper were both triple winners as they combined to score 60 of Mountain Lakes' 73 points. Moran won the 400, the hurdles and the high jump, and Cooper swept the thre distance rares.